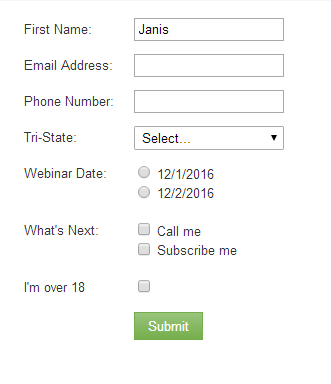 It's easier to customize a Marketo form if it's completely destyled to start. A float or margin-left that doesn't seem to respond to !important can drive a designer crazy, and time spent on CSS specificity & cascade behavior isn't well spent. My li'l snippet for removing Marketo's built-in styles has seen a lot of use via the Community and a few code versions (now at the venerable v1.103) but it hasn't appeared on the blog before. Does URL field type have a character limit? Indeed it does: 255 characters. And — unlike with Integer fields — this restriction is in sync with the SFDC field type of the same name, which also is limited to 255. This wouldn't be a problem, save for the fact that Marketo can't truncate longer URLs (including pathnames and query strings) to a guaranteed working URL. So if you're only storing pre-parsed domain names, there's no problem with the max field length. But if your source could be a full Referrer URL, or a long URL from your product catalog, it's certainly possible to go over 255 characters. If there's one official Marketo doc that needs some edits, it's the Marketo Field Limits by Field Type rundown. Unfortunately, that article has incorrect info and some sins-of-omission. Be warned: most of this post is (necessarily) dry and technical. But I always find competing claims to be interesting, almost regardless of the topic. Maybe you will too! Plus, even experienced high-level programmers (meaning languages other than C and C++) don't have this stuff at their fingertips, and may make implementation mistakes as a result. So if you're in a meeting and want to show some mild “data scientist” chops, these are good facts to drop. Values are limited to between -9223372036854775808 and 9223372036854775807. So 9 quintillion, 223 quadrillion, 372 trillion something. If such a number seems unimaginably high in a martech scenario, I fully agree (though don't forget the ol' Grain of Rice parable). When you use the default Forms 2.0 embed code, the form descriptor loads asynchronously. This means the inner HTML of the <form> tag isn't rendered until after the initial scaffolding of the page is finished drawing (often immediately after, but always after). Let me take care to say that this is a totally sensible default. Marketo can't know how many other asynchronous components are present on your page. You could have multiple content panes filled via Ajax, as and a bunch of other 3rd-party asynchronous widgets. In the absence of other info, and not knowing if the site is a complex corporate website or a simple (non-Marketo) LP, it makes sense to not have the form block other parts of the page from loading. Nevertheless, in practice you may notice an uncomfortable reflow of other elements as the <form> builds out its content, bulging into a larger area of the page. Floats can shift to a new row and such. If you want to tweak your robots.txt for protection against unwanted search engine indexing, the widely-circulated answer is that only Marketo Support can do this. That's not actually true, though. You can do it yourself.